Writers’ Trigger: When teaching poetry, I begin with syllabic verse. No worry here about meter and stress, just pay attention to the number of syllables. We begin with Haiku and then move on to longer works. “The Fish” by Marianne Moore is a good example of a syllabic verse poem. Each stanza is the same: line 1 has one syllable, line 2 has three, line 3 has nine, line 3 has six, and line 5 has nine again. Note the unexpected line breaks that surprise you at every turn. Write a short poem at least two stanzas long that depends on a syllabic count. Revise one of your older poems to fit a syllabic count. Does the revision strengthen or diminish the poem? Why? We drove south through New Mexico, headed west to Tucson, left our car with long-time friends in Tucson and took the bus to Mexico. 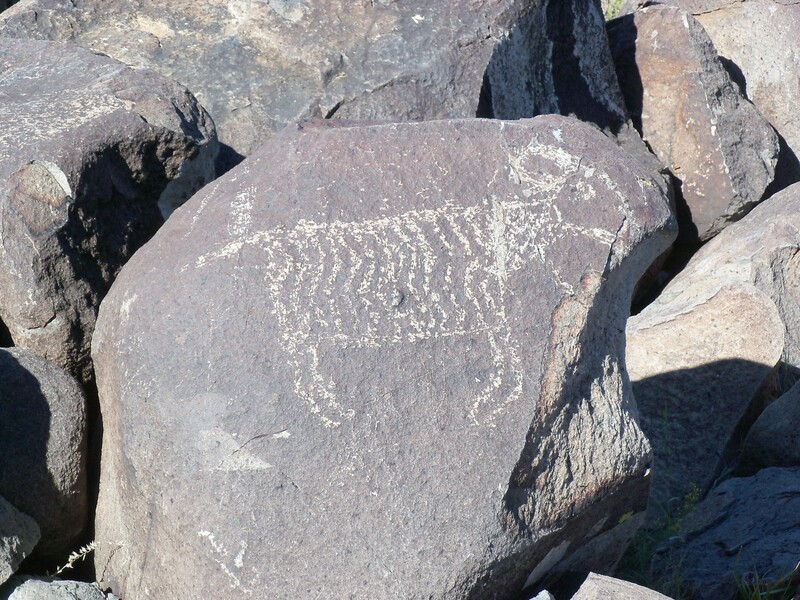 But first, we stopped in New Mexico to visit the Three Rivers Petroglyphs near Las Cruces. 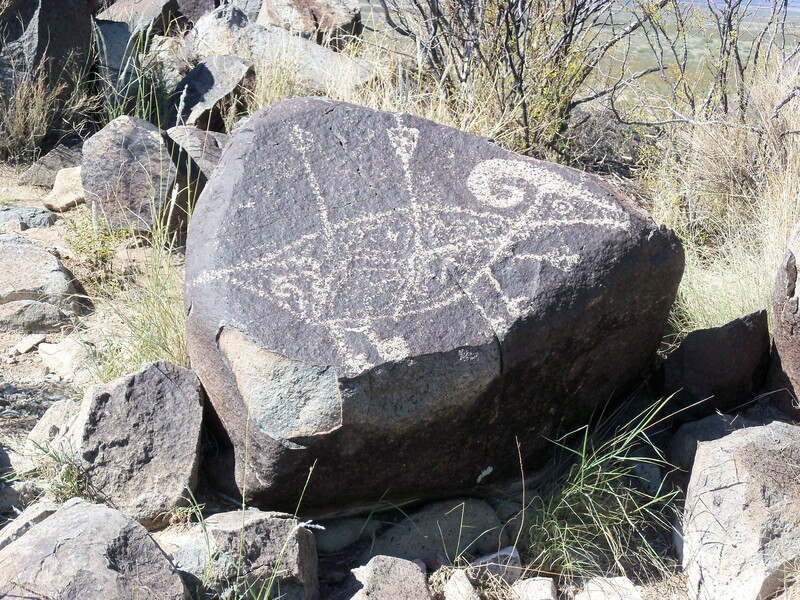 Although we have visited many rock art sites, we had never seen so many glyphs on rocks and boulders. In addition to abstract and geometric patterns, the glyphs include representations of birds, humans, animals, fish, insects and plants. 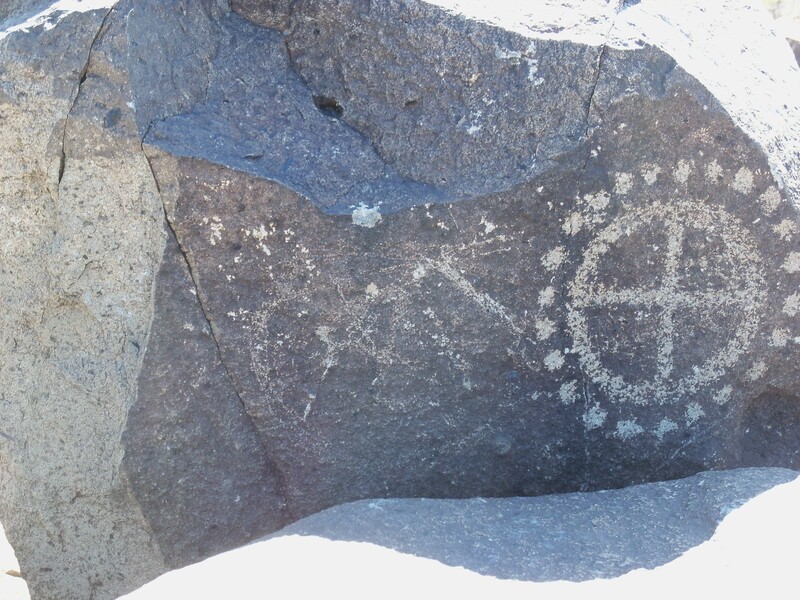 The Native Americans, working between 900 and 1400 AD, used their stone tools to remove the dark patina from the exterior of the rocks left from the last lava flow some time between 1,500 and 2,000 years ago. The lava flow covers 125 square miles, and at its thickest, is 160 feet thick. According to the signage, there are 21,000 glyphs. 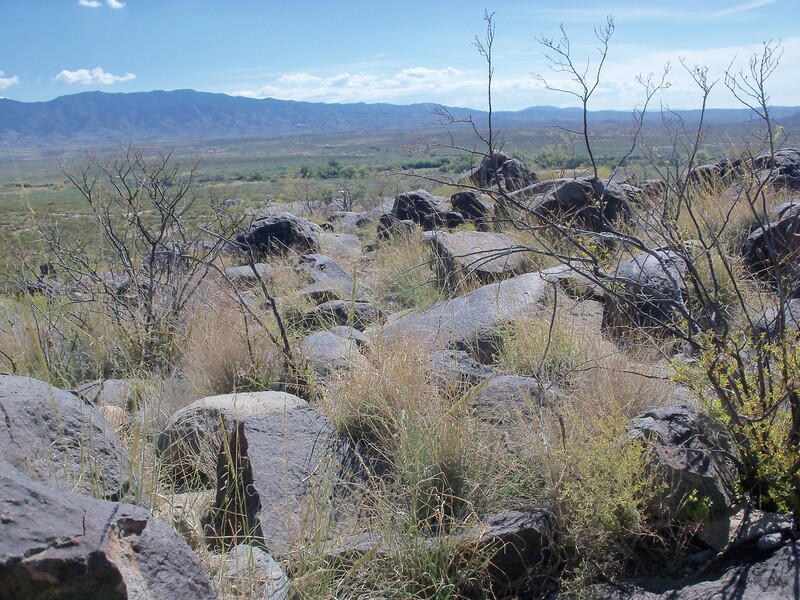 Climbing up to the site above the Tularosa Basin, we skirted boulder after boulder, each defaced. My mind jumped to graffiti artists tagging everything in sight. Mule deer, Barbary sheep, coyotes, foxes, birds, rodents, lizards and snakes populate the surround. If you look to the southwest, you see a the White Sands Missle Range (also a national monument). At this distance, the sand dunes are just a strip of white glistening in the sun. The same animals which live on the dark lava rocks are lighter colored on the white gypsum dunes. Adaptation at work. A lot of the geometric designs were universals. The inward spiral circle, the Maltese cross, the circle surrounded by dots, the steps… all these universals made me think of Joseph Campbell and his book The Power of Myth. I need to read that again. So we have this circle surrounded by dots. What exactly does this represent? Looking at pictographs is a little like taking a Rorschach test. I’m thinking that the dots represent people and the circle is the beginning and the end – the energy source. I’ll check with Campbell – see what he says.